Ticket to Ride ($6.99, update is free) was one of the earliest games we looked at for this weekly feature, and it’s still one of our favorites. As both a train and a board games nut, Ticket to Ride is right up my alley. An update released Thursday upgrades the graphics for the new iPad’s high-resolution display, as well as making the game a little easier for color blind users. For newcomers to Ticket to Ride, here are the basics. The object of the game is to complete train routes and stop your opponents from completing theirs. At the start of the game, you choose destination cards. If you complete these routes (Vancouver to Montreal, as an example) you earn the extra points shown on the card. If you fail to complete it, those points are deducted from your score. You’ll draw colored wagons and locomotives from a deck of cards. Match up the colored wagons to the route color (locomotive cards are wild) to complete the route. This is the sort of game where your victory can also screw your opponent out of their victory — which, to me, is very sweet. I’m color blind, and one nice concession the game’s developer, Days of Wonder, made originally is having small symbols on the routes and cards to help those that can’t see color. This made it easier for us to match them up. The problem was, you could only see the the symbols on the zoomed-in view. Now, with the Retina display, you can see the colors on the main map. I’m not going to lie: other improvements aside, this is a big deal for me. I never thought I’d say this, but I like the Retina maps better than the physical board game version (although I do think the font on the board game version looks nicer). 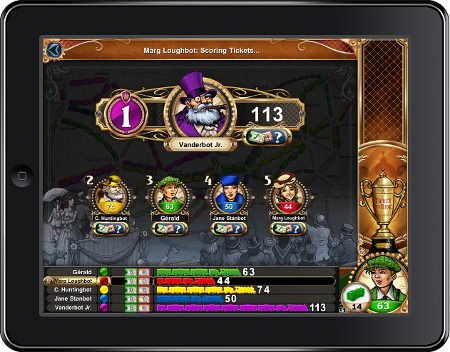 While I appreciate the beauty of console quality graphics on my iPad(s AAPL) via games like Infinity Blade II, I value the look and feel of an upgrade to games like Ticket to Ride more. This upgrade is one of those upgrades that really make me feel like I was suffering playing the game on my old iPad. So far the only thing I’m disappointed in is online play, which is still disjointed. While you can join a game with a random stranger right from the play screen, I still had better results going to the More screen and choosing Online from there. I called them out on this the last time I looked at the game and it’s disappointing to still see this as an issue. http://iPadBoards.org is now live with the latest news, hottest tips and best discussion on the iPad. Come join us and make the most of your iPad!